Blaine Air Permeability Apparatus - Gilson Co.
MA-10 Blaine Air Permeability Apparatus for determining the fineness of Portland Cement measures the specific surface area of fine materials in square centimeters per gram of test sample. By using this apparatus, a quantity of air is drawn through a bed of definite porosity. The rate of air flow is determined by the pore volume in the bed, a function of the size of particles. 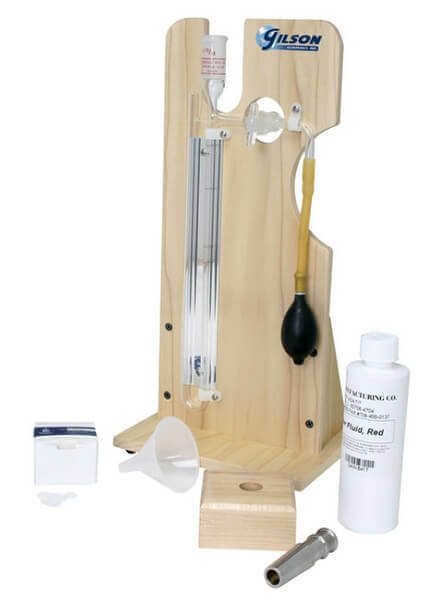 Components of the apparatus are a stainless-steel test cell, plunger, perforated disk, calibrated U-tube manometer, and rubber aspirator and bulb, and are all mounted on a sturdy wood panel with base. An 8oz bottle of red spirit manometer fluid, package of filter paper, and a wood block for holding the cell during filling are also included. NIST Portland Cement #114 is required by ASTM and AASHTO standards for calibration of the MA-10.